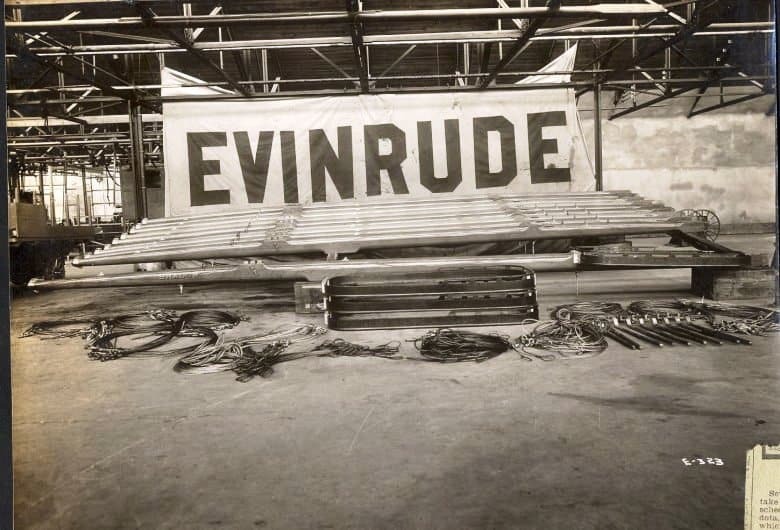 Ole Evinrude, inventor of the first reliable outboard boat motor, also built and sold stern-steerers in his factory for a brief time during the 1920s in Wisconsin. 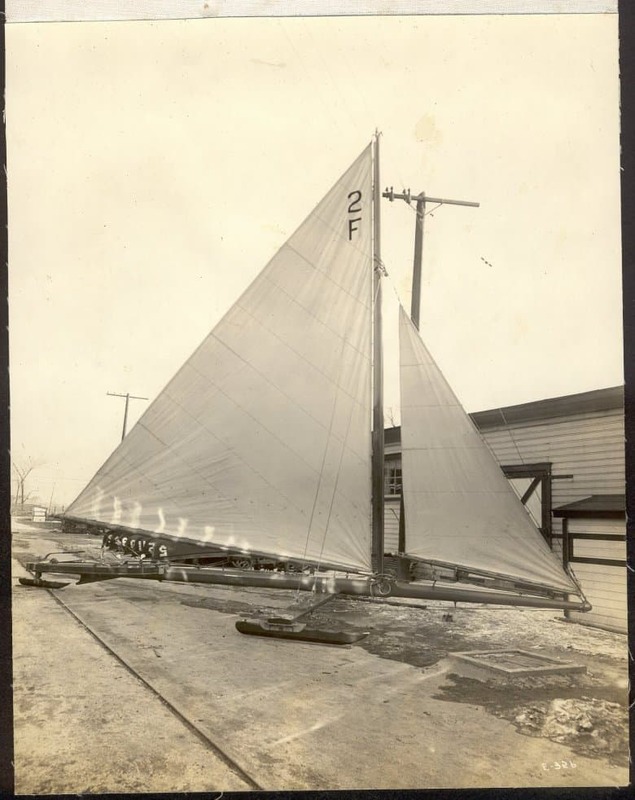 The caption in the magazine reads “Evinrude Motor Company: A novelty will be a fully rigged Class F ice boat.” Intrestingly enough, here’s another photo with an “F” on the sail. Thanks to Mike Peters for the photos. UPDATE: Mark Weiner writes: “Saw the photo’s from Mike Peters of the old Evinrudes posted. I though you might like some photos of an old Evinrude ( or at least parts of one) as it exists today. 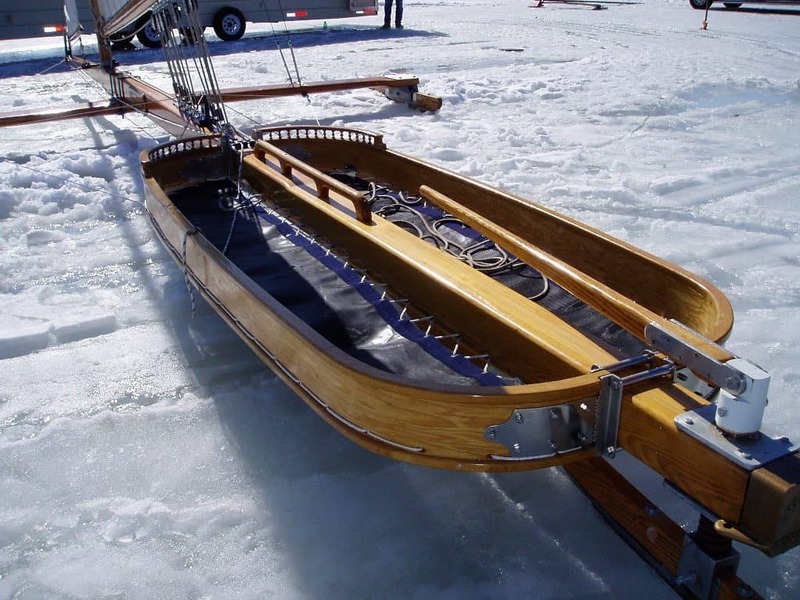 The boat is “Spindler”. Acquired about ten years ago and refurbished by Dan Tess and Mark Wiener. 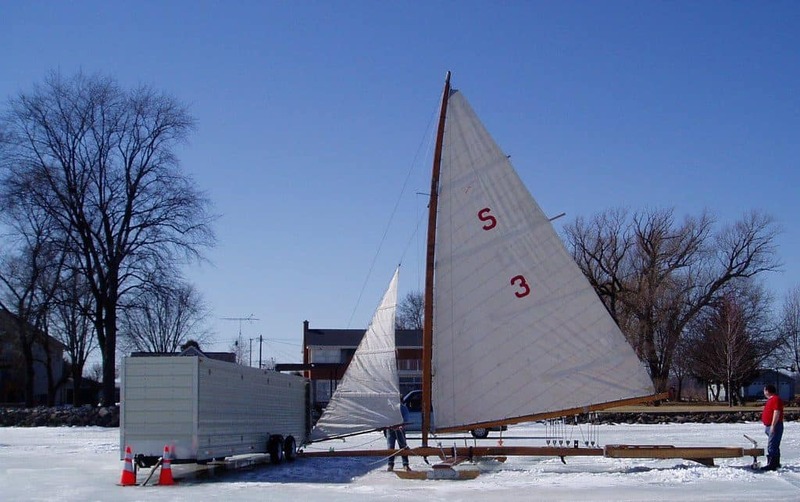 Home port of Fond du Lac. As you can see by the photos some parts have been rebuilt through the years, but there are may signs of the old boat still there. 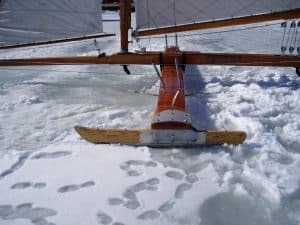 The most obvious is the tail block. 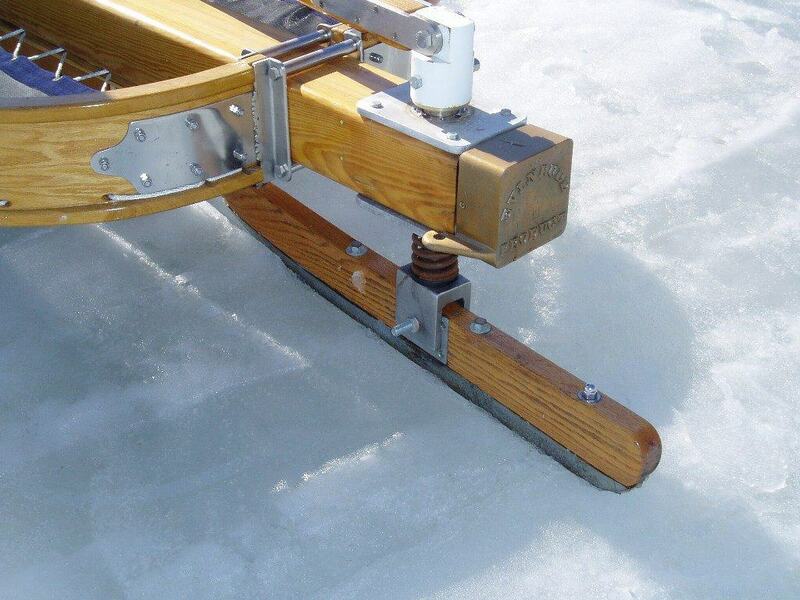 The runners, and the plugged holes in the plank for the saddle brackets. The mast is now a banana, but the sail cut looks much the same, and is still cotton. 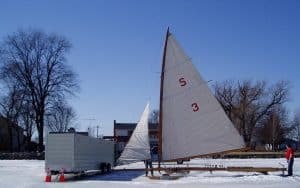 We are still doing work on her each year to make her sail better, but we do intend to keep her looking as original as possible. Where ever we set up, Spindler seems to be a crowd pleaser and a calling card for the sport. 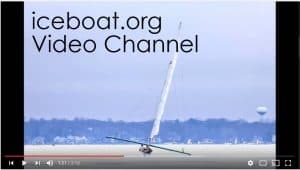 We do sail the “B class” with the WSSA when ever possible. 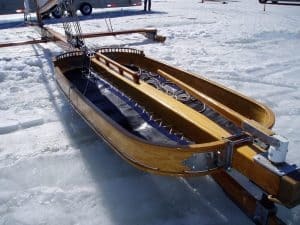 We are not the most competitive boat in the fleet, but we would like to see many of the old boats come out and sail with us. 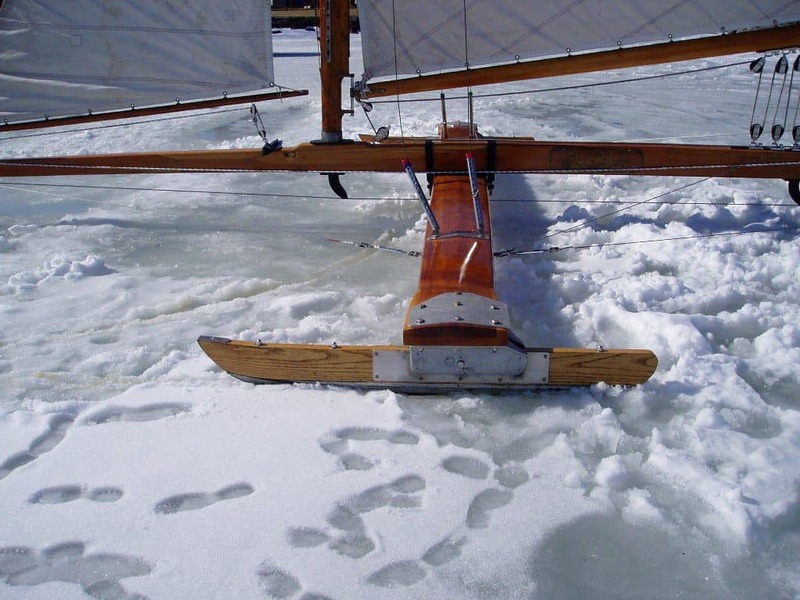 If we could get enough old boats on the ice we could start a cotton sail division.